BPSC Civil Judge 2018 Pre Result (Additional) Check Here. BPSC Civil Judge 2018 Pre Result Check Here. BPSC Civil Judge 2018 Answer Key General Study/ Law. BPSC Civil Judge Mains Exam Date Check Here. BPSC Civil Judge Mains Exam Postponed Notice Check Here. BPSC Civil Judge Admit Card 2018 Check Here. BPSC Civil Judge Revised Exam Date Notice. BPSC Notification is out. BPSC is recruiting for 349 Civil Judge Govt Job Posts. 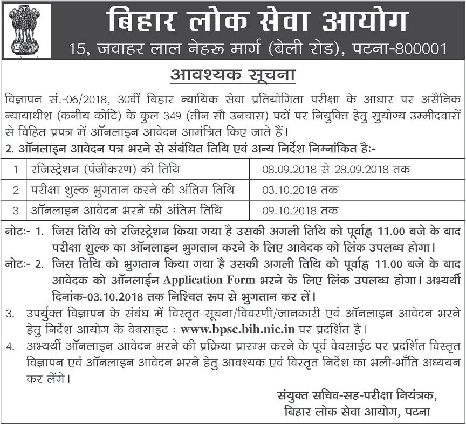 You can check BPSC - Bihar Public Service Commission last date, download BPSC notification, visit BPSC official website and check other BPSC Vacancy details.Complete Vacancy and recruitment Details about 349 Civil Judge Govt Job vacancies in BPSC are provided below by JobSarkari.Com only for you. Last Date of Apply Online. 28/09/2018. Last Date of Pay Application Fee. 03/10/2018. Last Date of Submit Complete Online Form. 09/10/2018. Application Begin For Mains Form. 14/01/2019. Last Date of Apply Online. 23/01/2019. Last Date of Pay Fee. 28/01/2019. Civil Judge Candidate Must Have Passed Graduation Degree in LLB 175 42 73 56 03 349. 4. Candidate Need to Apply Online Before 23rd January 2019. Q. 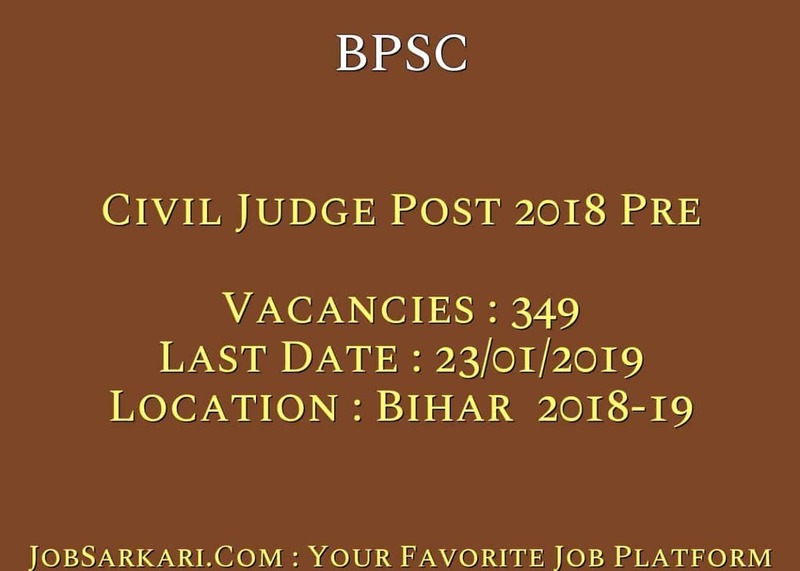 What is the Last Date For BPSC Civil Judge Govt Job Vacancy ? A. 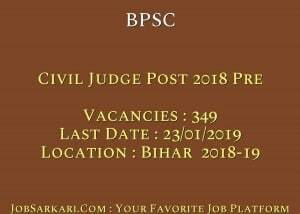 Last Date for BPSC Civil Judge Govt Job Posts is 23/01/2019. Q. What is the Form Type of BPSC Civil Judge Govt Job Recruitment ? A. The Form Type for BPSC Civil Judge Govt Job Posts is Online. Q. How many vacancies are available in Bihar Public Service Commission Civil Judge Govt Job Posts ? A. There are about 349 Vacancies in Bihar Public Service Commission Civil Judge Govt Job Posts.